Win #4 and The Dream! 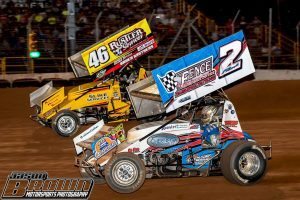 Featured Image by Rick Rarer an SprintCarNews.com! 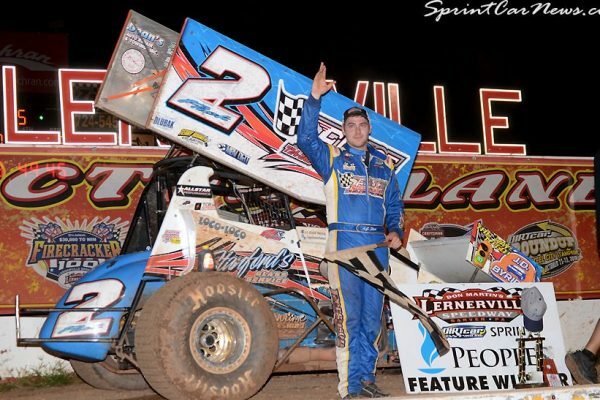 26 cars showed up at Lernerville Speedway Friday night. We threw a new setup at the car expecting a slick slow track. The rain prior to the races nullified that idea. Nonetheless, we kept the same setup in it to see if we could find speed. We were somewhat average in hotlaps but I didnt feel comfortable. We made some changes for the heat race and came from 6th to 3rd after a good start. The crew was happy but I still told them that I felt I was working to hard to make the car work like I needed it to. We went back to a tried and true setup for the feature. After starting 5th, we jumped to 3rd, fell to 4th, jumped back to second, and ran with the leader for about 17 laps; all while slicing through ridiculous lapped traffic. A restart on lap 18 bunched the field up and gave me some open air. At this point, the track had widened out and gave me a lane around the top. We got by the leader and within the next 6 laps, pulled out to a 5 SECOND lead for our 4th win on the season! Port Royal was a different story. We went back to that speedway with a setup we have felt confident with. put down a good time trial lap that marked us 20th overall out of about 36 cars. We raced into the feature through our semi by finishing 9th. I had high hopes prior to the feature but I believe I made a mistake and went the wrong way on my adjustments. I went with the approach that the books describe and ignored the feeling of the car. Simply put, I made it worse. I could feel the car get worse and worse every lap as the fuel load burnt off. Trust me, this night of notes is well documented and I wont be making that mistake again. Thank you Ferguson Heating and AC, Fence by Maintenance Service, Chernega Construction, Champion, Steel City Indoor Karting, Johnny Carpet, JD Byrider, Stanford’s Glass Service, Townsend Gas and Oil, and the rest of my marketing partners for the continued support!